Principia’s 2016 Summer Sessioners could barely contain their enthusiasm about their time at the College in June. First-timers were delighted by the wide range of courses on everything from Bible studies to art, astronomy, and history. Regular attendees were happy to see many of their favorite instructors back again—with new course offerings. Kelly Peticolas (C’90), Director of Principia Lifelong Learning (PLL), noted students’ lively curiosity. Two favorite courses this year were Choir and Xi Jinping and China. The former culminated in an end-of session performance led by Dr. Joe Van Riper (C’05), Chair of the Music Department at the College. Political science professor John Williams (C’’76) taught the popular course on China, offering insights into China’s current political realm. 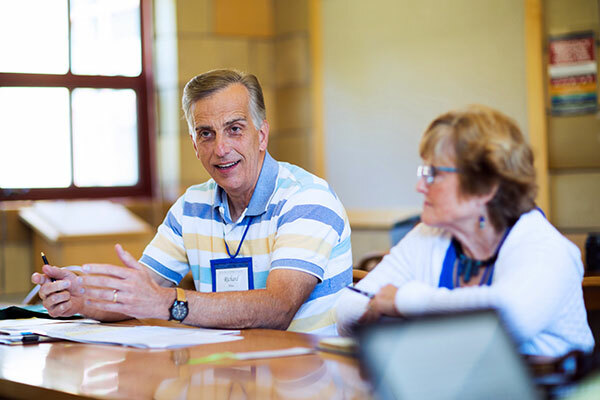 Summer Session faculty are active throughout the year, leading Principia Lifelong Learning trips and giving talks for Principia Clubs around the country—and Summer Sessioners often attend those trips and talks. In fact, a few participants from recent PLL travel programs to Peru, Paris, Prague, and Vienna shared their experiences during Summer Session, as did Dr. Marie Jureit-Beamish, Principia Professor Emerita of Music, who had just gotten back from leading PLL’s Paris to Prague River Cruise before she started teaching at Summer Session. Similarly, Clark Beim-Esche, a retired Principia faculty member, will be leading a trip related to his Summer Session course later this summer. Based on his book, Calling on the Presidents: Tales their Houses Tell, the trip will explore several Boston-area homes where former U.S. Presidents lived.